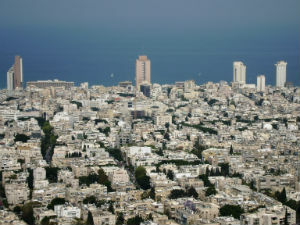 Constructed by Jewish-German architects immigrating to the British Mandate of Palestine following the takeover of Germany by the Nazis in the 1930s, the White City is composed of 4000+ buildings and occupies a portion of Tel Aviv. 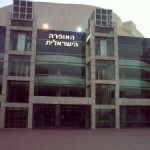 Employing the International, or Bauhaus style, of architecture in creating the buildings, these innovative architects were preceded by the development of the concept for the White City by Patrick Geddes, a Scottish city planner commissioned by the first mayor of Tel Aviv, Meir Dizengoff. While Geddes arranged the street layout and determine block sizes, he did not decide the architectural style of the buildings. By the middle 1930s, many Jewish architects favoring the Bauhaus school had already fled to the BMP, partly to escape the growing threat of Nazism and partly due to the closing of Berlin’s Bauhaus school. Consequently, the White City’s public and residential buildings were fashioned by these displaced architects because they lived nearby and because an absence of traditional architectural conventions existed at the time they were living near Tel Aviv. In addition to incorporating features of the Bauhaus movement, the architects also adapted buildings to deal with the extreme desert/Mediterranean climate. The use of light colors, mostly white, to reflect sunlight and rising heat gave credence to why it is called the White City. Incorporating large areas made of glass (a common component of the Bauhaus style) was replaced by recessed windows that were smaller and helped limit the glare and heat. 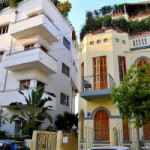 Balconies in the White City are narrow, long and shaded by overhead balconies so that residents can enjoy breezes coming from the sea. Roofs were built to be slanted instead of flat to provide a place for people to congregate during the cool of dusk. In 2003, UNESCO (United Nations Educational, Scientific and Cultural Organization) named the White City as a World Cultural Heritage Site, stating that the city was an “outstanding example of new town planning and architecture in the early 20th century”. 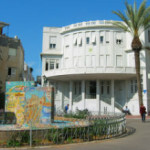 Although many of the White City’s buildings suffered neglect and ruin over the years, some have been renovated and 1500 of them are slated for restoration and preservation after passing of legislation in 2009 by the Tel Aviv municipal government.